Living in an HOA can come with a legion of perks—like gorgeously manicured common lawns, swanky amenities, and some rad Fourth of July BBQs. But there's a reason that a stigma exists against homeowners associations: Board members on a power trip can institute some ridiculous rules. Ridiculous, like "restricting the color of trampoline covers" ridiculous. Like "You must keep your garage door open during the day" ridiculous. Even when you feel like your HOA has turned into an implacable steel trap determined to ruin your life at every turn, find comfort in this: Homeowners' associations are bound by the rule of law, no matter what the president of the board says. State and federal law restrict HOAs' abilities to restrict you. Below, eight things HOAs do that can cross the legal line. Your homeowners' association's board might like to play tyrants, but here's a line they can't cross: the Fair Housing Act. "An association must be careful enacting and enforcing rules that would single out or disadvantage any group identified in the Fair Housing Act," says Craig T. Smith, a lawyer in Hilton Head Island, SC. That means that your HOA can't fine you or keep you from purchasing a home in the neighborhood because of your ethnicity or race. They also can't kick you out because they hate your religion, or don't like Germans, because you have children, or because you wear a Make America Great Again hat on a regular basis. States often have additional protections safeguarding you. For example, California law protects sexual orientation and gender identity. This time-honored tradition saves money and protects your clothes, but to your eagle-eyed HOA board, all those fabrics blowing in the breeze may not look "uniform." Too bad, buckaroos: Since almost half of states protect your right to dry, any anti-clothesline additions to the covenants, conditions, and restrictions (CC&Rs) are downright unenforceable. Feel free to let your denim wave in the wind. Fines are the lifeblood of a malicious HOA—and we cannot, unfortunately, tell you that they're blatantly illegal. But they "must be set forth in the association's rules and bylaws," says Barbara Jordan, a real estate lawyer in Columbus, OH. Are threatening letters making an appearance in your mailbox, telling you to trim that rosebush or face a fine? Check the community's CC&Rs before complying. If that fine isn't listed, you might not need to pay. Of course, that doesn't mean your HOA board will roll over, either; you might need to appeal the fine. If so, first scrutinize those CC&Rs to make sure you have standing. Then, gather all the evidence you have and present it at the next board meeting. 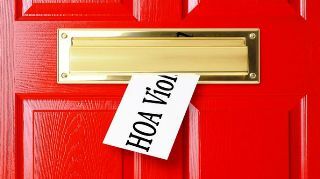 (Your HOA may have specific instructions for this process—make sure you follow them!) If your argument is sound, they could pull back the charges. Your community's HOA treasurer can't suddenly decide she hates pink mailboxes. Next time Shirley Homeowner comes over complaining, practice these magic words: "Is that mentioned in the CC&Rs?" And slipping rules in under the cover of darkness is an HOA no-no. The regulations for how new rules can be enacted should be outlined in your CC&R—and if the HOA isn't following its own stipulations, you have a valid complaint for any secret swashbuckling. If you do suspect something shady is afoot, start requesting documents and attending public meetings. Your cable TV decisions are protected, thanks to the FCC's Over-the-Air Reception Devices Rule. No matter how ugly your HOA thinks your space-gray satellite dish is, it can't force you to take it down. Hello, cheap cable! You might find that some HOAs still have antenna restrictions written into their covenants. These may be retro artifacts from pre-1997, when the FCC's new rules came into play. If you spot these curious addendums in your CC&Rs, take your concerns straight to the board. After all, you have the federal government on your side! Snippity HOAs might make you think they're above the law—but if you're truly in a bind, you can challenge that assertion. Chances are good (although not certain) that you'll have the upper hand in a proper court of law, Smith says, especially if the board of directors acted in an underhanded manner. If the association's governing documents allow it, start by demanding a hearing before the board. If that demand is met with silence, take it one step further: to the actual courts. "This is typically a move of last resort," Smith says. But if you're past the point of mild frustration, a lawsuit might do the trick. Homeowners have sued their board for the right to display a sign critical of the HOA. And one Olathe, KS, homeowner successfully filed a lawsuit to keep his elaborate landscaping—which another resident said was the "nicest-looking [landscaping] in the entire neighborhood." Not all states protect your right to grow an environmentally friendly garden abundant with native plants. But if you're in Texas or California, you can push back if the board's not savvy with agave. And Florida, too, has its own homeowner-friendly rules: HOAs can't restrict plants simply because they're not in the community's overall design plan. If you don't live in one of those states, persuading your HOA to embrace eco-friendly policies isn't impossible. With the right attitude and enough evidence of go-green benefits, you might just convert the entire neighborhood. No matter how many letters and fines the board throws at you, you still have rights. "Show up," Jordan says. "Go to the meetings. Be on record as objecting to the issues. Write letters." Just make sure to follow the process for objections. "Do not miss deadlines or forgo opportunities to be heard," Jordan says. "That will only hurt your case." And do what you can to get your neighbors on board. Together, you can call for new elections or push to scrap excessive or unnecessary rules.